The Pentagon has long been looking for a way out from under its tradition of massive, multi-year, multi-billion-dollar projects. With the rapid pace of technological development, military leaders have sought tools and strategies for more rapid acquisitions. There’s the Defense Innovation Unit, or DIU, a Department of Defense effort to make faster use of emerging technologies. Some organizations have also turned to contractual tools such as the OTA, or other transaction authority, as a means to accelerate the technology buying process. Recently, technicians at McConnell Air Force Base proved that homegrown ingenuity can make a difference, too. Workers there used a local partnership and a modest development effort to craft a portable, solar-powered communications system. “The military needs to be ready to go anywhere and solar enables that,” said Tech. Sgt. Clayton Allen of the 22nd Air Refueling Wing. As a non-commissioned officer in charge of the wing’s XPX innovation team, Allen led the effort to shrink down the standard communications package and make it self-sustaining. The three-man team got the job done in about 400 hours, working in cooperation with Wichita State University’s GoCreate rapid-innovation lab. “We took it from a box the size of a small room and made it something you can drag behind you like luggage, weighing about 150 pounds,” he said. An expeditionary force typically might have to spend a couple of days setting up its communications operation. The newly developed unit works right out of the box and costs about $12,000 less, the team said. As a solar-power unit, it also does not rely on the presence of a generator, making it easier to deploy in a wider range of circumstances. 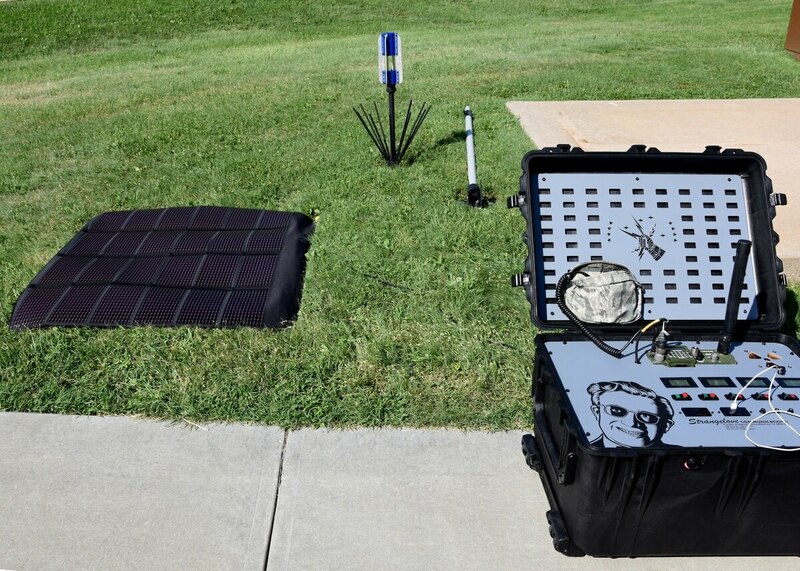 “It is completely self-sustainable, powered by solar power, and the solar panel can extend the [battery life] out almost indefinitely,” Senior Airman Aaron Walls, an XPX innovation team member, said in an Air Force news release. The partnership with GoCreate proved key to the rapid development of the new system. Backed by a $3.75 million grant from Koch Industries and the Fred and Mary Koch Foundation, the lab offers 18,000 square feet of sophisticated tools and equipment, along with the support of advisers who help developers to create working prototypes. The lab was especially helpful in providing access to the 3D-printing technologies that allowed the team to rapidly fabricate brackets, bezels and clips that together support the antenna mast. None of these customized objects were available commercially, and the 3D printing gave the team the flexibility to experiment as the design specs emerged. All this allows for a process that is both faster and more precise than a standard military procurement. “It meets our needs as we go, rather a pursuing a contract with an outside manufacturer who wouldn’t necessarily know what we were going for,” Allen said. It takes about a half day to charge the solar-powered system, but the radio can run for seven days on a full charge, with a range of about 240 miles. “You don’t have to be a radio expert to reach that distance. We’ve optimized it to reach max communication range right out of the box. All you have to do is set it up,” Allen said. The unit acts as a power station as well: Users will be able to plug in laptops, coffee makers and other small items. The team is field-testing the new system now, with an eye toward deploying half a dozen demonstration units to various wings within the coming months.